An excellent and tasteful combination of two flavors of high nutritional value that help you start your day full of energy. 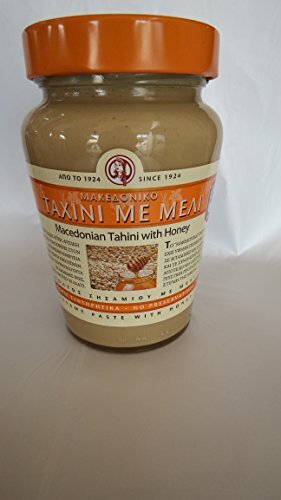 Try Macedonian Tahini with honey on a slice of bread, toast, with breadsticks or cookies. Then your favourite breakfast will become your favourite afternoon snack too. Macedonian tahini is produced using exclusively selected varieties of sesame which are dehusked, baked and ground in a traditional way, in stone mills, without any chemicals, conservatives or other additives. Retaining excellent conditions of hygiene and safety, HAITOGLOU BROS S.A. applies a quality system accredited by ELOT according to the ELOT ΕΝ ISO 9001 standard in the production of Macedonian Tahini in its modern facilities in Kalohori, Thessaloniki, packaging it in airtight glass jars. If you have any questions about this product by Xaitoglou, contact us by completing and submitting the form below. If you are looking for a specif part number, please include it with your message.